Mr. Bean and I both have facebook pages where we enjoy keeping up with family and old friends. Recently, I've gotten pretty lazy about posting photos to mine. When he does all the work of captioning the photos and tagging the people in them, why should I duplicate the effort? Since Mr. Bean has been uploading photos to my page for me, we've had somewhat of a competition about who gets more photo comments. Usually I do because my album is newer therefore higher on the list that your friends see. Last night, Mr. Bean uploaded an album, but refused to upload it to my account since he wanted all our mutual friends to comment on his album instead of mine. Since he had only 7 comments in 24 hours, he went ahead and uploaded the album to my account a 17 minutes ago. I already have 9 comments. He he he. Sucker. I told him that his status update should read, "A comment on my album is a vote for me. A comment on my wife's identical album is a vote against me. You decide." 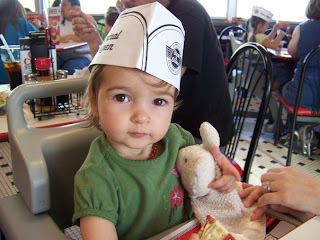 String Bean considers a career at Steak-n-Shake, but reconsiders when she realizes it involves wearing this hat, Guy (in her left arm) can't go to work with her and does not involve coloring the whole shift long.